The Last Supper, by Simon Ushakov ca. 1685. This lovely and simple Russian Orthodox treatment emphasizes the betrayal of Judas, who faces away from Christ, bag of silver in his hand. 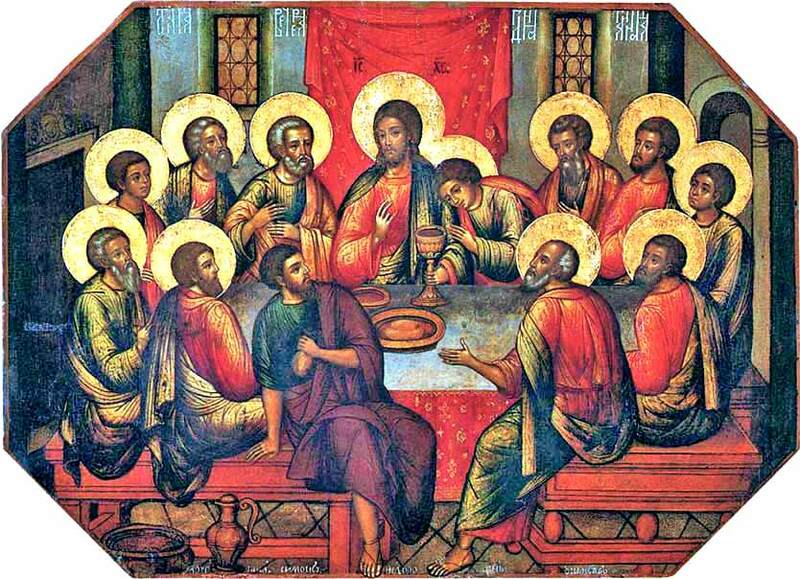 Maundy or Holy Thursday is traditionally the day when we remember the Last Supper and the formal beginning of the New Covenant. This lovely modern song is performed by \"Shira\", a Messianic (Christian) Jew. Merciful Father, I am guilty of sin. I confess my sins before you and I am sorry for them. Your promises are just; therefore I trust that you will forgive my sins and cleanse me from every stain of sin. Jesus himself is the propitiation for my sins and the sins of the whole world. I put my hope in his atonement. May my sins be forgiven through His name and in His blood may my soul be made clean. At the end of John 12, Christ told his followers that he had not come to judge the world, but to save it. Here, he demonstrates physically that his mission is one of love rather than one of judgment. God has humbled himself to be born into the world; and now Christ humbles himself, out of love, to wash the feet of Peter. The act is similar to baptism but, literally, at the opposite end of the spectrum. When John the Baptist baptized Christ (and when many denominations baptize members), the symbolic cleansing water was poured onto the top of his head. This was purely a spiritual cleansing. It symbolized of the Holy Spirit entering the soul. But Peter has already been baptized. He is completely clean, except for the dust of the road he has picked up by leading his daily life. Just so, we are spiritually bathed when we are baptized. But we are still human and need Christ to remove the soil we have collected during the day. That is, we need to confess our recent sins. Christ points this out, saying "he who has bathed needs only to wash his feet". The head symbolizes the mind or the soul, and the feet, the most humble and practical nature of our bodies. No matter how clean we have become, our bodies — our feet — will become contaminated by our sin — the "dirt" of daily life. 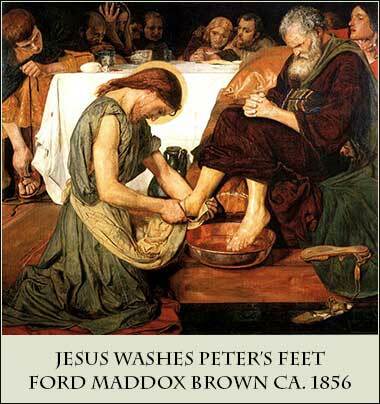 To stay spotless, we must remember our sins and ask for forgiveness each day, just as we clean our bodies; for Christ is not only willing to shrive us of our daily sins, but also eager: He practically demands that Peter to allow Him to wash Peter's feet.